August 10, 2016 – At ENGEO, we don’t just stand behind our work. We stand behind the people who make it possible. A positive work environment is essential to a healthy business and has been a central component of our success. So we’re proud to announce that ENGEO has earned a place among of the country’s Best Small and Medium Workplaces recently announced by consulting firm Great Place to Work® and Fortune. ENGEO won this accolade based on employees’ anonymous responses to an extensive survey about their levels of trust, pride and camaraderie at work. 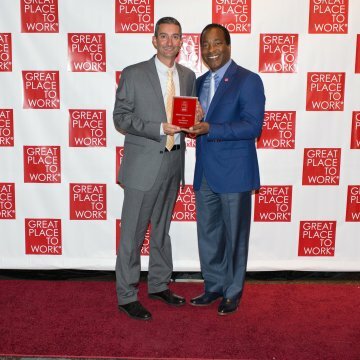 Great Place to Work® reviewed the survey results of more than 52,000 employees from hundreds of companies in the ranking process. Among the findings from the study: trust fuels business performance. For example, the Best Small and Medium Workplaces enjoy roughly three times the revenue growth of their peers, while providing a better experience for their people. “It was surreal and humbling to be in a room full of like-minded companies that value culture. It was an honor to represent ENGEO and to be recognized for our culture,” says Bob Boeche, Principal Engineering Geologist and ENGEO’s San Jose office leader. ENGEO came in 24th on the list of 100 medium sized companies. The Best Small and Medium Workplaces is one of a series of rankings by Great Place to Work and Fortune based upon employee survey feedback from Great Place to Work-Certified TM organizations. This is the 10th consecutive year that ENGEO has made the list of best workplaces named by Great Place to Work and Fortune.